Redshift had a backdoor base that didn't block vision and i don't remember any complains about blink. Was the usage of IZGs not appealing enough, or were other aspects of the map too weak? 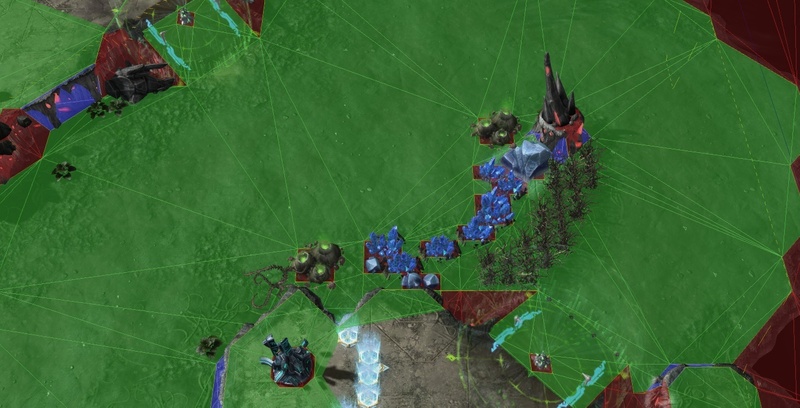 As you well noticed the biggest issue from my personal perspective was the fact that first the overly diverging attack paths mean that players armies can't easily meet in the center creating a higher preponderance to base race situations. 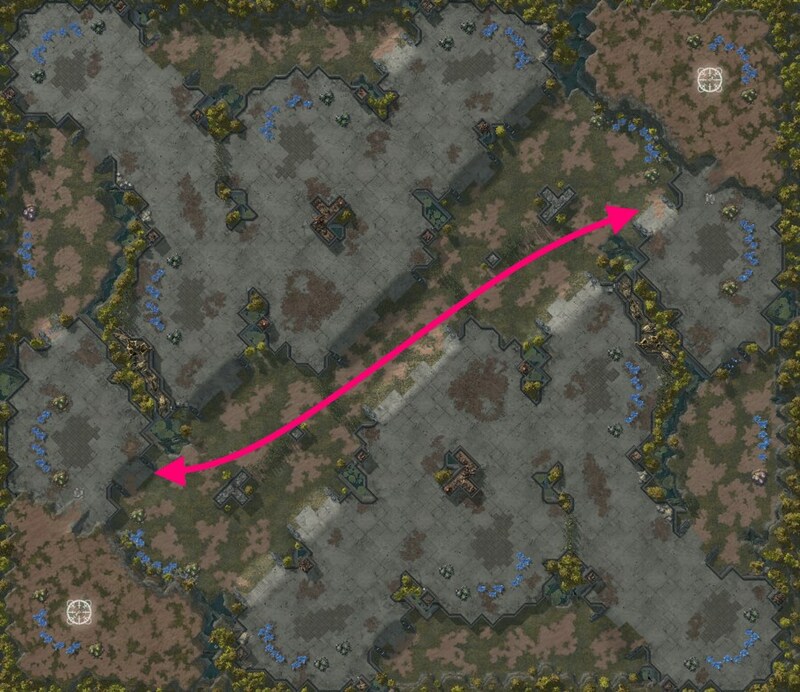 Players have been focusing more and more on these map split situations in the latest TLMC's, and as you might have seen aswell it is becoming pretty standard for maps to reach such late stage games, therefore going forward it would be very recommended for mapmakers to focus more in making sure that said lategame stages arent problematic causing overly passive gameplay. The last factor was of couse the slim usage of Slowing Zones specially in the areas where players will interact the most, and the alternate issue of them being in areas that will promote overly passive gameplay. If you want more feedback on it, id recommend asking Avex, as he also probably had other things to say. Was the meta of the gold walls and natural ramp walls too much? Or was the meta too advanced for the noobs? Any other glaring issues? 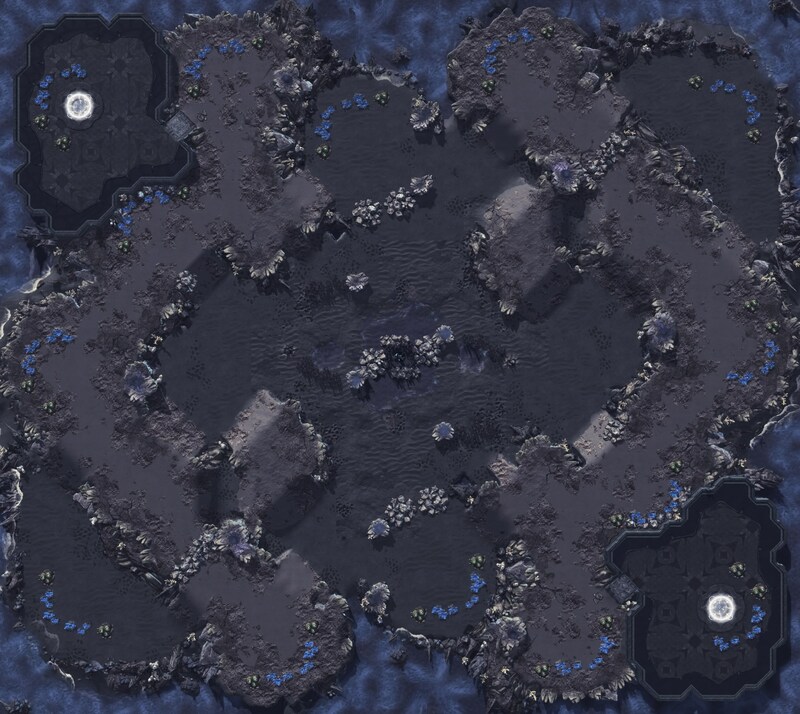 For this particular map, I think that the mix of Gold patches with the new wall patches is just too much for overall playerbase, that's it without even mentioning the metagame from such a thing, just picture a Z taking a proxy hatch there, getting some spines mining from the gold patches like people used to do on Expedition Lost and wall patches only to then gain a second entrance to the enemy base by mining the patches at the ramp. It is simply too much synergy. I think that the idea of having alternative entrances to the nat with the new mineral walls is certainty something that everybody needs to explore more of, specially now that we saw that RQM did with Thunderbird and the 5 mineral patches, but we still gotta be careful with how we set up these sort of things. 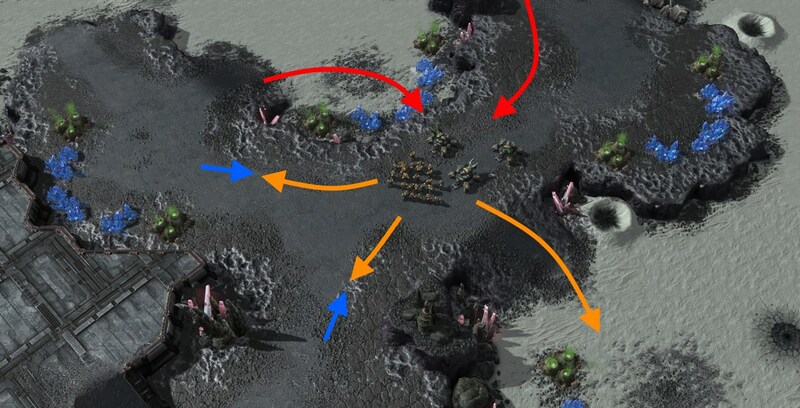 When it comes to structural spacing of the map, I feel that there's simply too much space not used efficiently enough, around the 3 and 6 oclock areas, right "behind" the natural bases there is some air space that isnt strictly needed, and could have been better used by pushing the main and natural bases closer to the edge of the map, therefore releasing space to be used more in the center, and that way you could have done something more interesting than the long thin path, maybe something of a snakey path? Akin to a horizontally mirroed Anomaly. 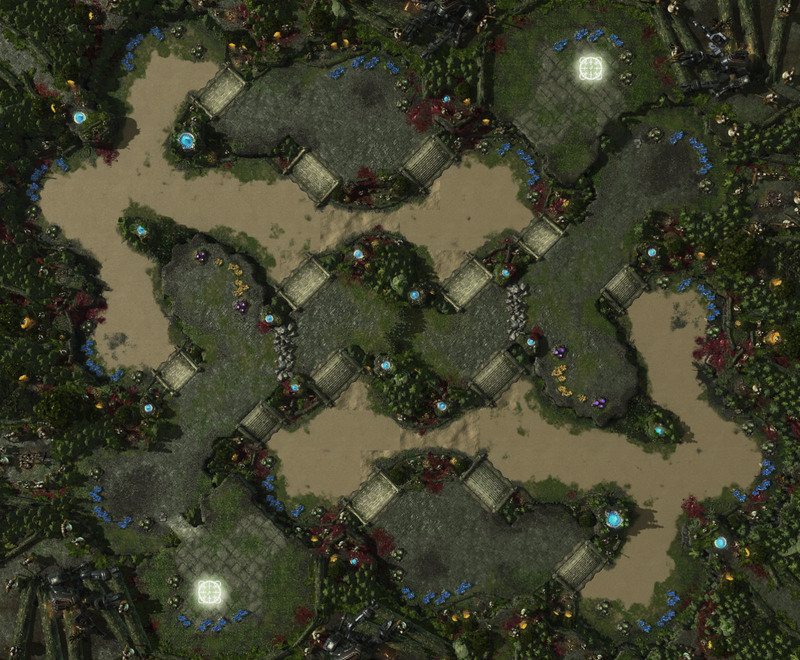 That said, it would still be problematic because as you know the mirror symmetry doesnt lends itself to creating all that interesting SC2 maps. 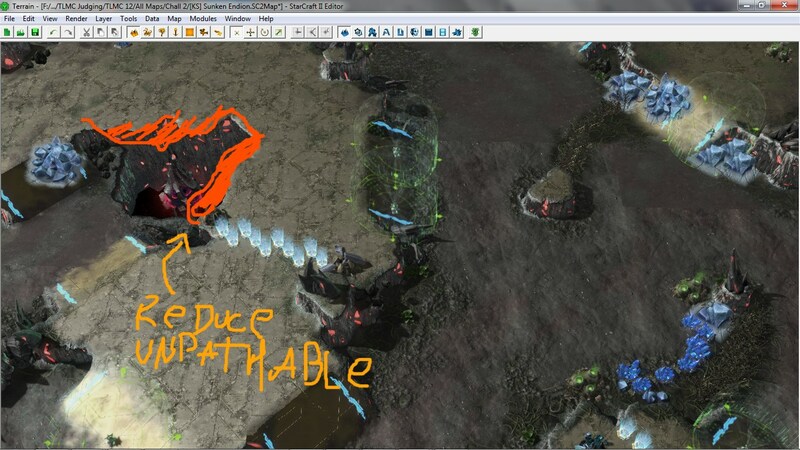 Is it considered a problem that the entire nat/in-base third can be blinked/DT shaded/infested terran/etc. over without vision? 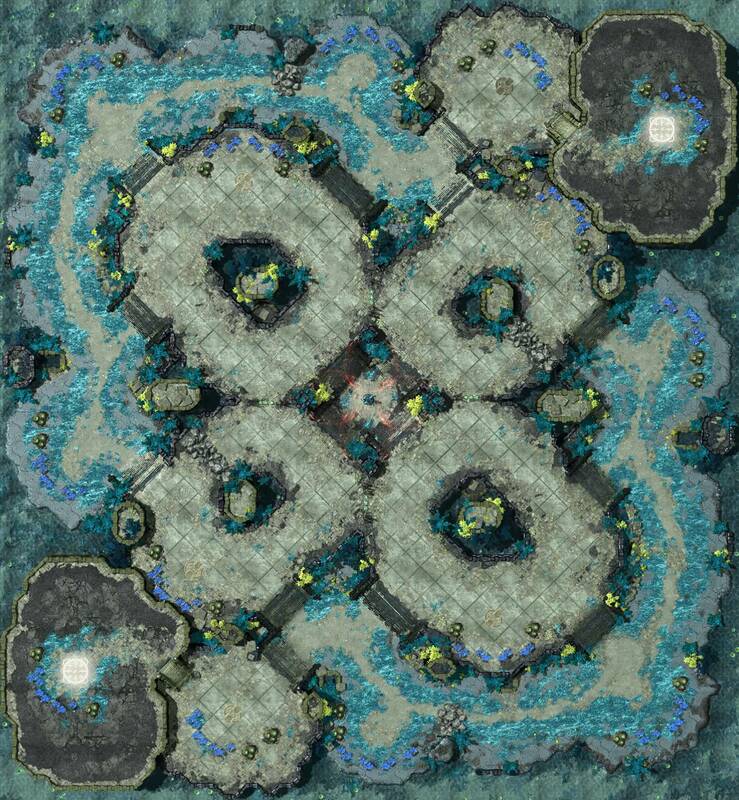 Not really, the DT thing is considerably minor, as it is a lategame scenario where players will have counter play measures, the Blink stalker aspect might be slightly more problematic, but even then that's still minor because TvP with stalkers isnt meta, and the main aim of blink stalker allins is more than anything to be able to break the main base or do harassment there than the natural itself. The infested marines part is also not quite much of a problem given that they arent used for 2base timing pushes, but as lategame anti-air tools. Right, that all makes sense to me. The only other point of view that I can think of is that you don't want players being 'surprised' by builds they didn't realize were possible - for example, a hand full of blink stalkers appearing behind your natural without the P player having gotten a robo would be confusing. Or a dark templar appearing at a terran's in-base third that they assumed would be protected by detection at the natural if the P player never got a robo. Of course, these scenarios could be fixed fairly simply with highground or LoS blockers lining the edge of the bases (would need to be on the defenders side with ignore placement requirements so there are no corners with vision). 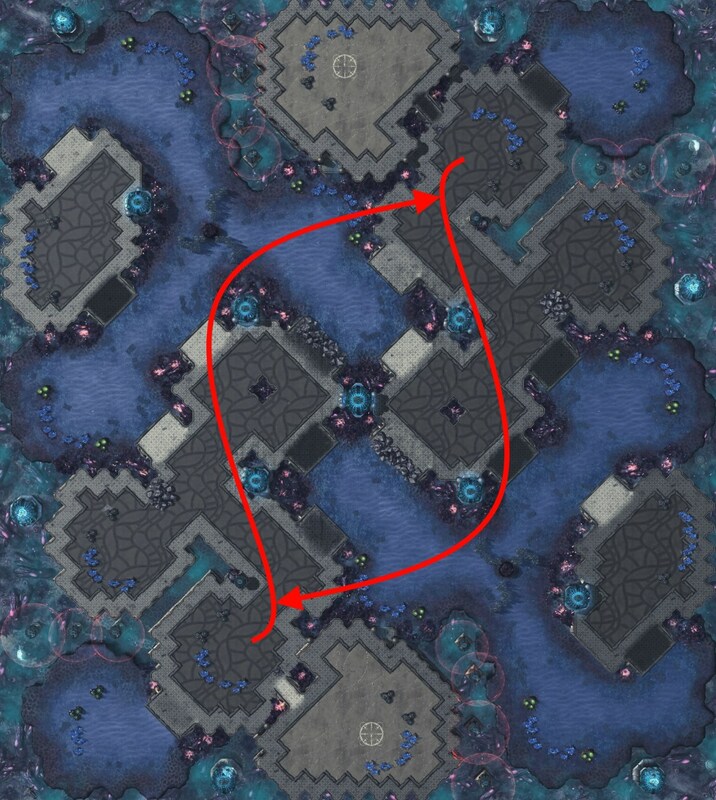 Edit: Forgot to mention that it is the 'standard practice' to assume that your natural cannot be blinked or DT shaded into except for the front choke without vision, because that is how every map is with the exception of an unexpected sightline in the natural on Blackpink, which was abused in the GSL. 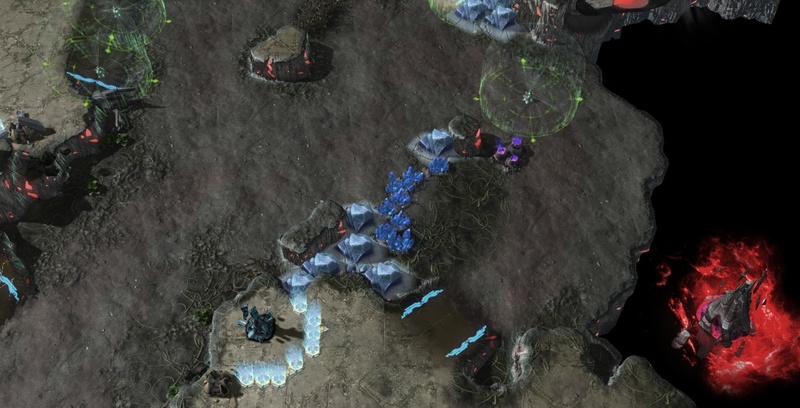 On a map like Redshift, I can see how the set up is much less problematic because it is in fact a prominent feature of the map, and would not be a 'surprise' to players for blink stalkers to show up without a robo. Yeah, I can see where you are coming from, but even then I think that we have got enough head space in order to create those situations, I dont think it is bad to allow said places in certain maps, but only if those scenarios are telegraphed correctly to the player, and in here I think that the gap is short enough to provide players with the idea that it will be blinkable. Hmmmm, I think..... I think that issue in particular of naturals being "safe areas" should be brought up to the DevTeam to answer as it touches into too many areas for "us" to decide. 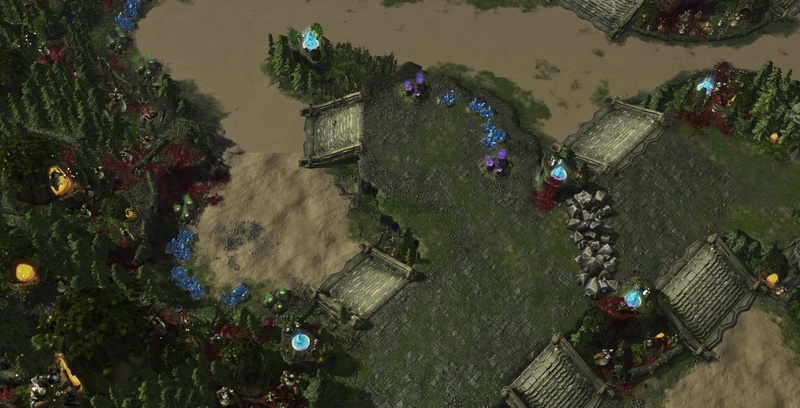 I think that, it is pretty clear given past maps Blizzard and DevTeam have released that they arent all too concerned with creating aggressive natural bases, specially if we measure that factor by the openness of the natural chokepoints or something of the sort. Now when it comes to actual TLMC, judges have been raising the issue of exposed naturals but with a different gist, they generally want the natural bases to be "above battling ground", meaning, it would seem that players want naturals to be quite safe, with a ramp leading down from it. From my perspective and from theirs that would be an answer to things like Lurker pushes, and other sorts of timings. The general opinion is mixed tho because either natural base set up has got different challenges and benefits from both mapmaking and gameplay angles, and I wouldnt advocate one of the other for mappers to do. But yeah, something to keep in mind. -Specifically looking at the bases and area around the xelnaga tower. 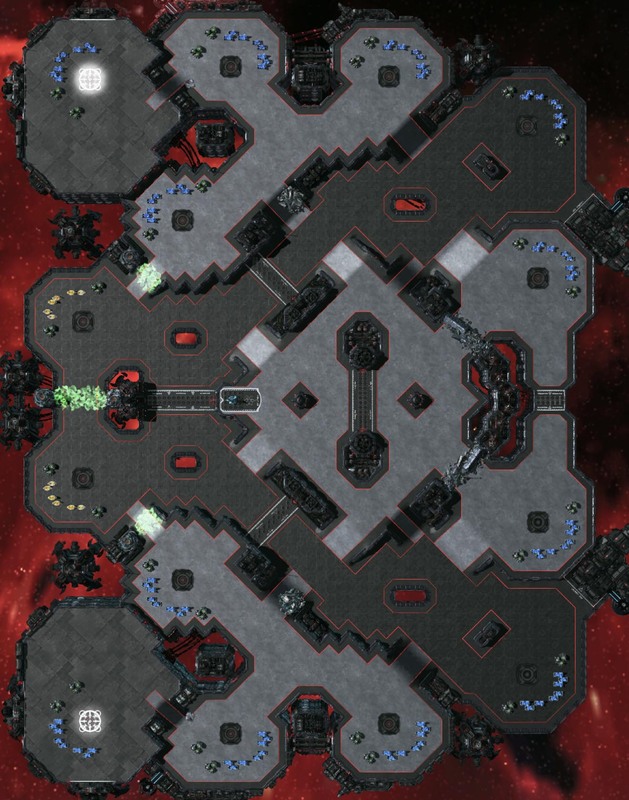 -Would it be wise to turn this map into a standard map and try next TLMC? Tho my actual issue would be with this area. The changes to the 2 ramps, would be in order to "open up" that area that way hopefully avoiding problems with armies being able to deny "forever" the "exposed" lowground base, tho it would have the drawback of making the highground 3rd base considerably more exposed to players, a possible fix for that besides the slowing zones in the cardinal ramp might be to add 6x6 sets of rocks on "the closer to the third" side of the ramp. The terrain object there in front of the third base would probably be biting slightly too much into pathable area, maybe you could find fitting replacements for that shard doodad in the actual doodad section. 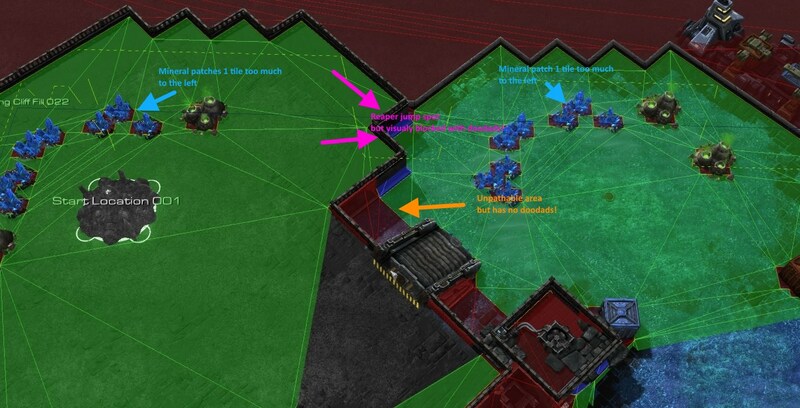 I'm aware of a lack of overlord pods and potential liberator issues at the horizontal third. 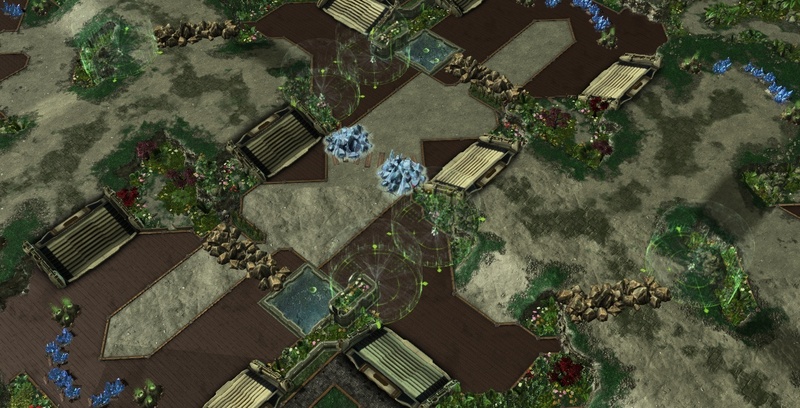 Currently I placed overlord pods above both rocks (clockwise behind them). I have an updated image with aforementioned pods but since they were not part of the official submission you're free to ignore it. Furthermore, I'm in no rush with feedback so feel free to put this last (or even ignore it) if the workload becomes too much. 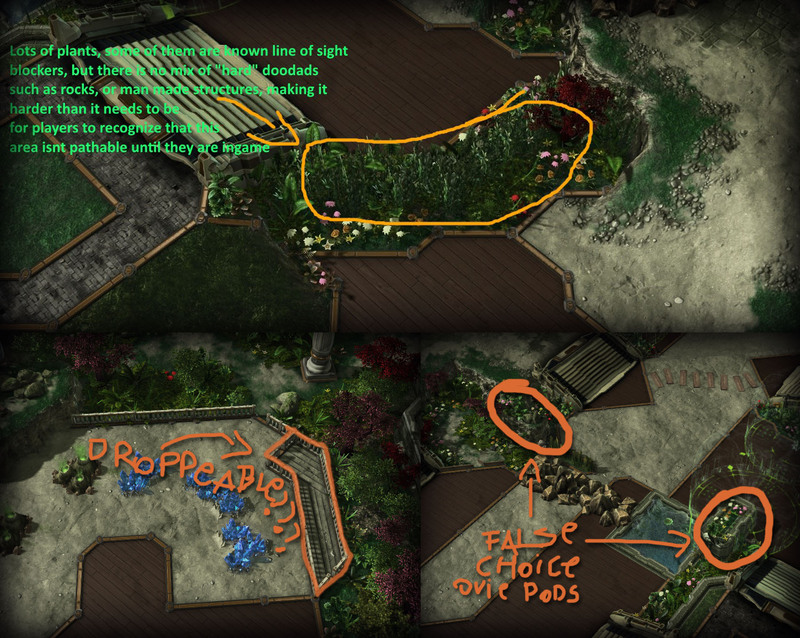 First and foremost, for all that's holy, please make the map easier to read, the texturing already makes it hard to read, but there are wayyy too many areas that arent instantly recognizable to the pathable, even more so given that you are using plants scattered across different levels, or areas which give false choices such as overlord pods that arent so. It is 100% alright to have cool aesthetics, like the walking area behind the third, but do not create situations where players can easily get confused. In the ovie pods in front of the lowground third, those are false choices because if one where to park units there those units could rather easily get sniped by units standing or giving vision from the highground. and potential liberator issues at the horizontal third. Thanks for the feedback, really appreciate it. Turning the exposed base into a mineral wall is certainly the right choice and really clever. Guess I'll have to come up with interesting terrain leading into the very corner bases of the map. 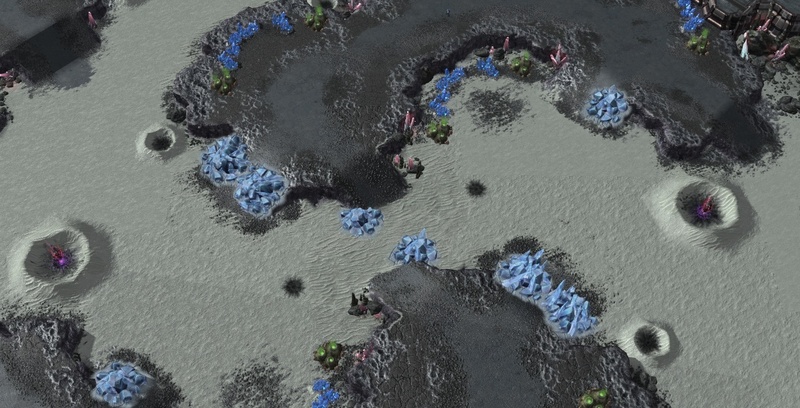 I was hoping the slowing field that makes the corner base harder to take was tolerable, since the distance to the last expansion is so low and could encourage the taking of the lowground third (where the slowing field directly guard the base instead). I get it tho. Would probably be more annoying than interesting most of the time and not work out as planned. Curious what the biggest issue with this map is because it has the standard main/nat, has a choice of thirds and from each third you have many options for a 4th so the expansion pattern of the map would be constantly changing and thus bending to the styles of the players. Each base offers plenty of harass opportunities to keep it from being too turtlish. I'm guessing maybe the middle is too restricted and judges didn't like that? Although, it's something that we don't see often and would force engagements in the middle where it's choked I figured. Correct, the center throws the map out of whack because there simply arent true ways to go from one side to the map to the other without needing to retread beyond the center, and even then for players to do that they still need to take down rocks. There isnt nothing wrong with having maps with a very tight center, I think maps with a center even tigher than this would be alright as long as measures are taken to avoid said center from "ruling" the map, the issue here with Into The Beyond is that said counter measures werent taken. The main attack paths are simply too strongly etched into the map, the rocks, even when they open it up a bit more, it just isnt enough. Even if the rocks where removed the main attack path is still probably too strong. 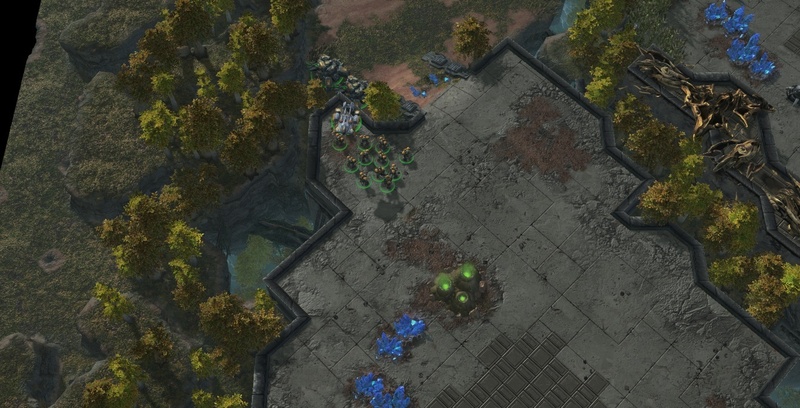 That position would be super problematic in TvZ, ZvP and TvP, or any MU where surrounds to a siege army are needed. For as generic as it might be, something like this could be better. Still not ideal because of the rather short distances, but still would be a positive step. Would prefer to know what the biggest issue with this map is and if you believe it's the gold or not? Having a super easily takeable but super harassable gold base seems like a huge risk vs reward which would be fun. 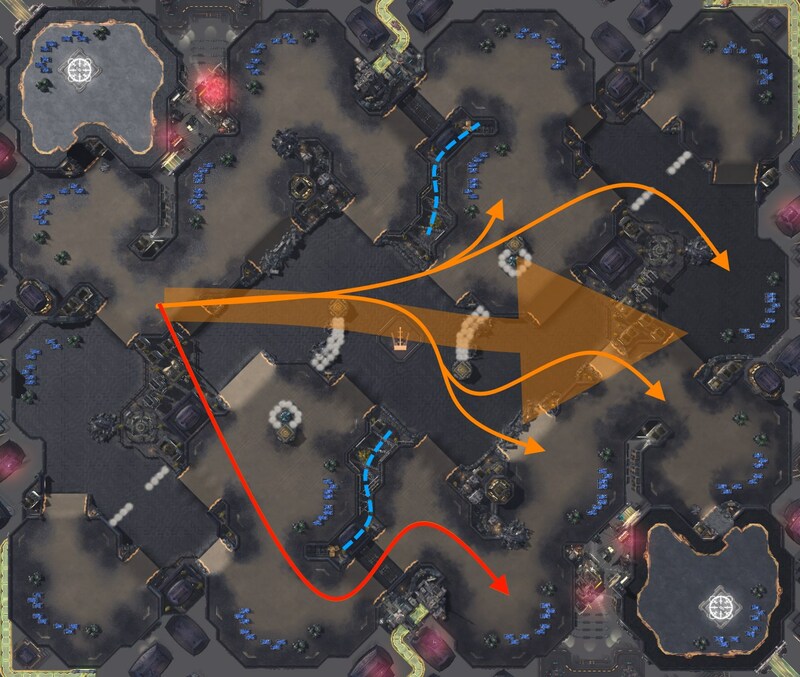 The rocks block early game movement and also help hold / harass the gold. The pathways, especially once open are everywhere around the map, plus there aren't too many super wide open spaces so even moving armies anywhere on the map doesn't make you feel completely exposed. Yet, there are plenty of attack paths so flanks can easily happen. 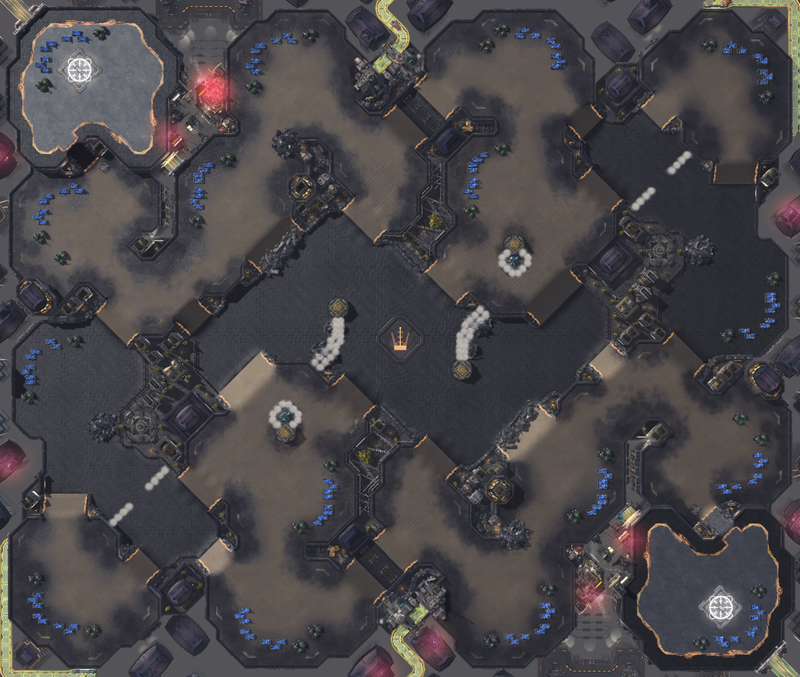 I believe this map is improved on from the TLMC11 version which judges said the middle lowground bases didn't serve a purpose but still curious. Issue is that those are simply winner's golds, whom ever takes and maintains the base basically wins, or gets a considerable advantage. Just because of those golds ZvZ becomes broken, not to mention ZvP. I was very much rallying against Hyper Rich bases, because we saw a high amount of them, and in the past we have already had issues with "simple" gold ones, Hyper Rich bases only make things worse. I'm still very open to the idea of "a next Habitation Station", in Gold base usage. But adding 2 Rich Vespene (each equivalent to 2 normal geysers btw) to it just isnt the way to go. Something akin to this ↑ maybe? Mostly i had my hopes for this map. I like it. Was it dismissed because of the offensive highground? Thats what i maybe would expect, but i think it is far away enough, even with offensive tanks. And it wasnt called out in the pre-feedback. Is it maybe just too "standard" in a way and brings nothing new?! But it also I feel takes away from the map itself, personally I have got a platonic love for those central highgrounds, probably because I really like Matchpoint. But with past experiences players arent all too comfortable with them, and given that there are indeed several pro-player judges, I can very easily see that feeling players have getting in the way of slightly higher scoring. That said, I dont consider the map "overly dull", or too standard, I think it is kind of a sweet spot, I would certainty recommend you to re-submit it, and lastly I would recommend to try to make open areas, slightly more open, as personally currently even when those areas are "ok", because of the cliffing that you are using said areas just feel more choked up. A solid standard map, that has a little bit of a different middle part. The XNT is very powerful, so the straight way through the middle is blocked off with Inhibitor zones, to even this out. 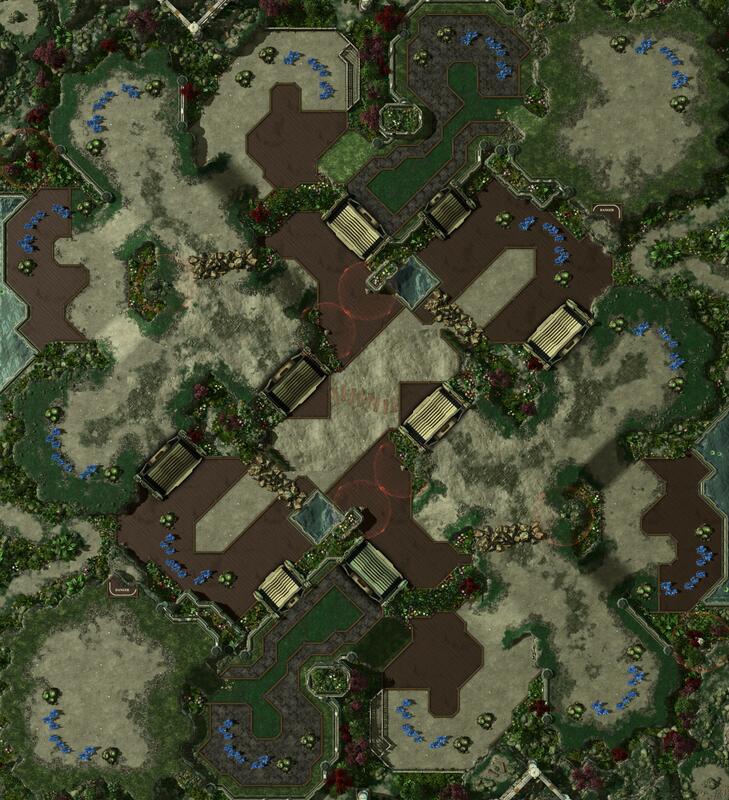 In the older Version of the map from TLMC11, the small lowground in the middle could be totally blocked off with 4x collapsible rocks, which was interesting, but created some little racial imbalances. So the inhibitor zones were just perfectly to balanced out the XNT. The middle part of this map, was just predestined for inhibitor zones. Despite the Presubmission feedback, i didnt change the inhibitor fields, after thinking about this for a long time. 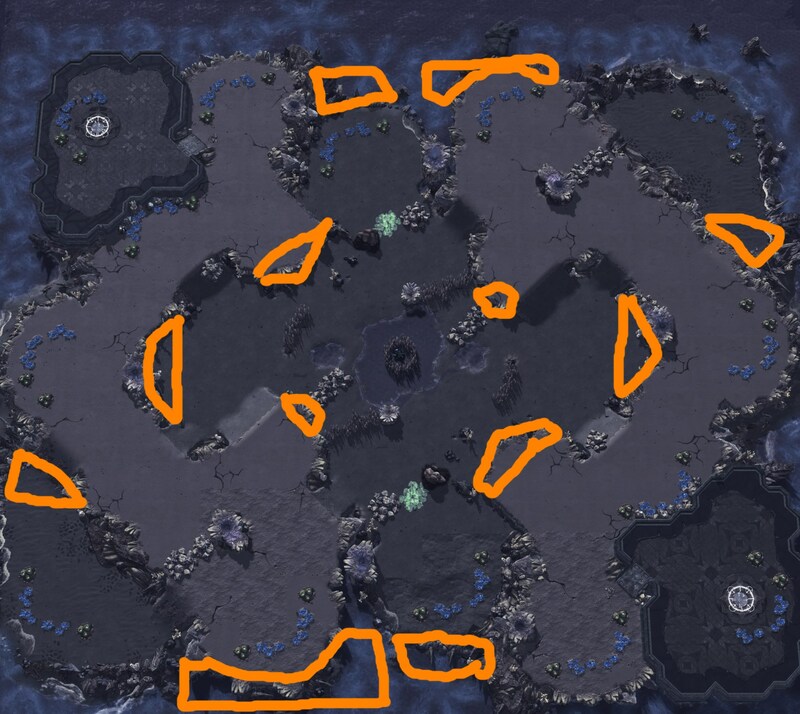 Im not a fan of placing more inhibitor zones and combine those with additional rocks or such. I think it would make the map too complicated and a bit annoying to play on. The introduction of inhibitor zones themself add a pretty new features, that needs to be used very carefully. They need to be introduced in a gentle way, if they should be ladder apropiate, and not used all over the place to overkill the players in like 6 different places with 2 different appraches to it. Players shouldn't be forced to move through them at some point. The map should mostly be played in a normal fashion, with a little twist, or they end up like RMTs. 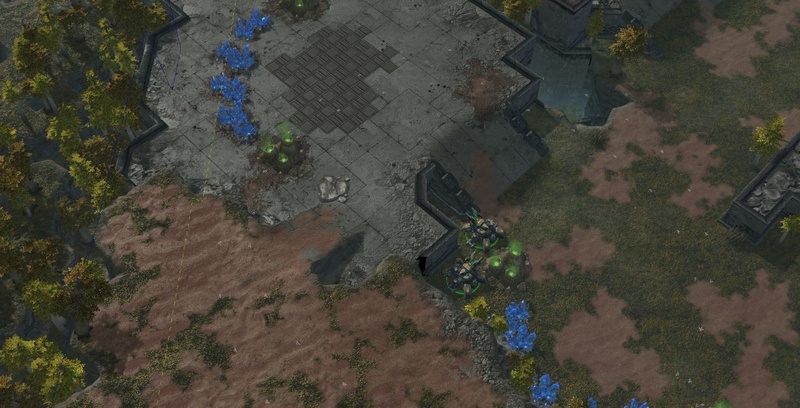 Also im completely not a fan of a Inhibitor zone+ rock combination to block off a path. First a smaller army, ist just faster when it moves through the field. 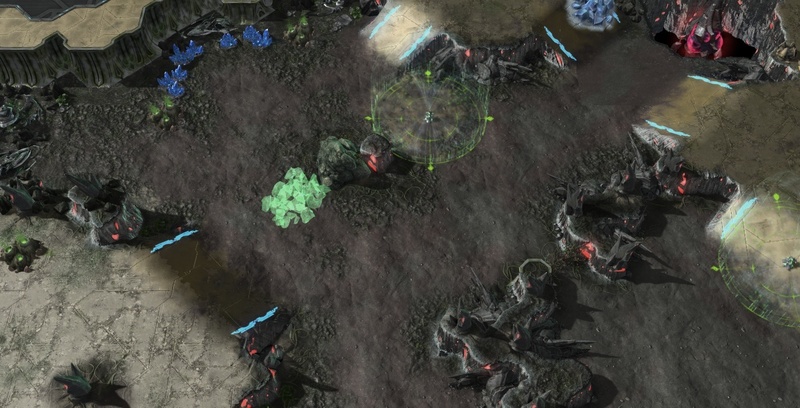 Later a bigger army might clear the rocks quicker, but then there will be a path that is half affected from an inhibitor zone, half not. An army moving through will be half quick, and half slow, and gets scattered, or you wait with the quicker part for the slower part to catch up and in the end you could have just blocked the complete path with the inhibitor field anyway. 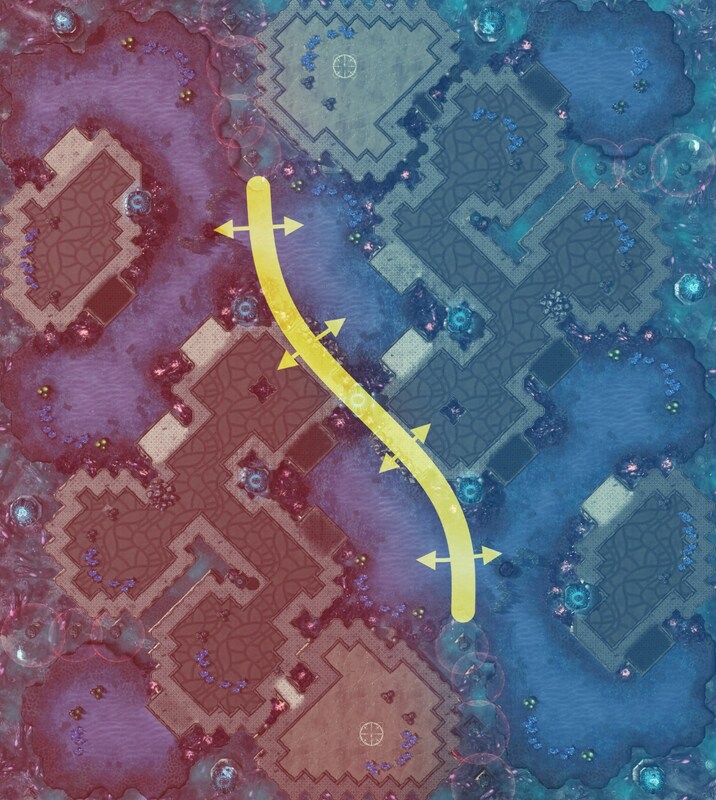 I think have a path half affected from the inhibitor zone, can be very annoying. 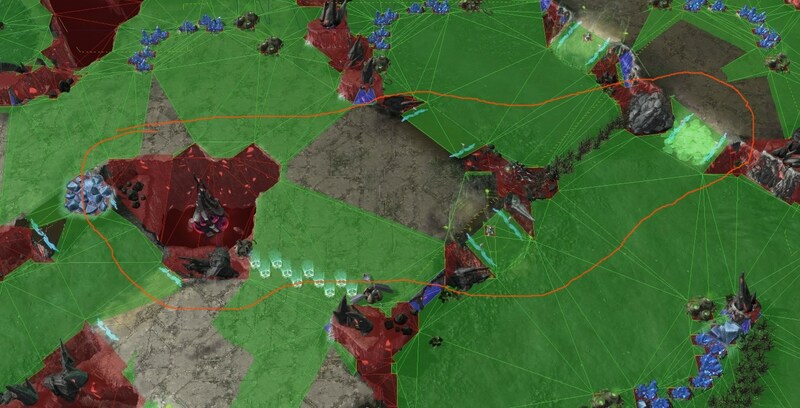 Image you are always forced to manually funnel a bigger army through the thin part of the path that is not affected by the zone, because the ai will not care of the zone when it calculates army movement. You would have to split your army into smaller parts and move them one after the other, to be quicker then move them all at once. This might add something to do for the player and rewards the player that micromanages more, but for eventual viewers it is more entertaining to watch actual interaction between players, and not players trying to properly move smaller parts of an army around the inhibitor zones. 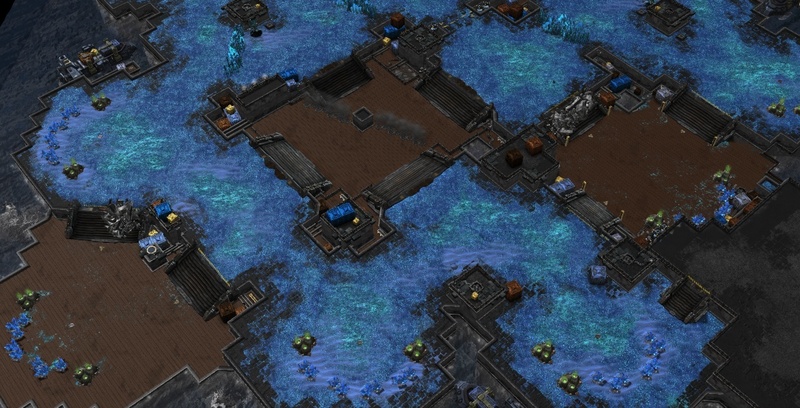 Sc2 has enough action to offer we dont need aditional minigames on the map. Also it is just annoying for players that dont have a proper apm to micromanage you army movement like that and still keep up your macro. Just my thoughts. I really wanted few IZGs and i wanted to balance out the powerful XNT with a XNT + IZG combo. As we saw in the tournament people don't really micro around the IZGs and tbh dont really interact with the IZGs at all. They mostly just didnt care, the IZGs had little impact. Wouldnt it be nice when players are forced to interact with the IZGs because its combined with a powerful XNT and dont just move through them somewhere on the map by chance? So was it maybe dismissed because you think XNT + IZG isnt as cool of a combo as i thought, and i didn't spam IZGs enough everywhere? Regarding the Slowing Zones, we had others maps that were submitted that had suuuuper soft usage of Slowing Zones, yet the issue is that, on many of these maps the usage was so soft so as to make it that the Slowing Zones didnt affect games played on the maps, or that they could be almost ignored altogether, and the problem with that is that it goes against the idea of having said areas be introduced and having players actually interact with them to begin with. I think that you are indeed right on realizing that it wouldnt be all too fun for players to need to avoid Slowing Zones all the time, yet, Shamrock itself goes too light on it. 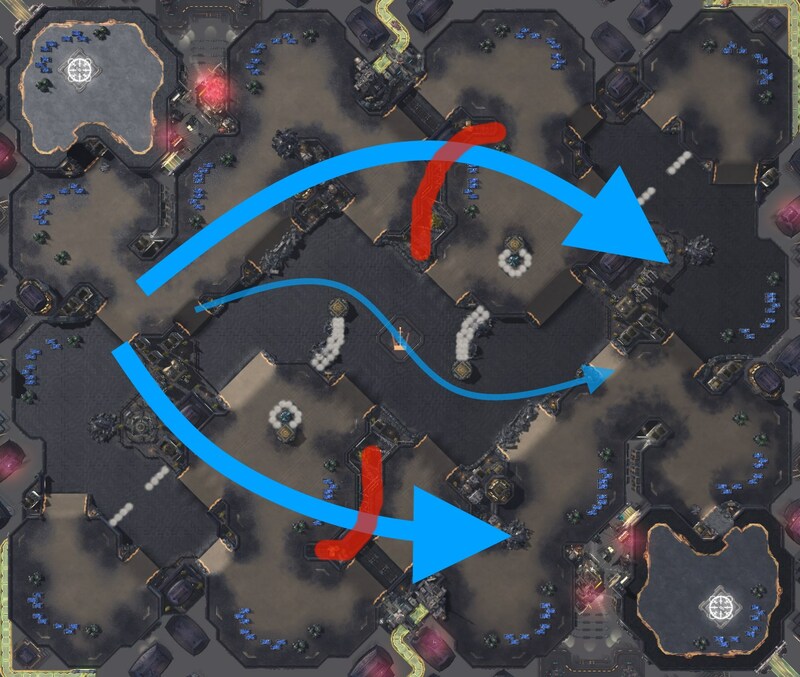 Having slowing zones on the Xel'naga is alright, yet not having them anywhere else when there's a good potential for them is missing the chance. I think that the suggestion to add more IZG's, it showed screenshots on too many areas, I consider that maybe adding half of what you saw/was suggested would have been a more than acceptable middle ground. DevTeam wants players to experience different flavors with the Slowing Areas, the issue with Shamrock and a couple other maps is that said extra flavour is simply overly diluted, and even when you are indeed correct of players not really interacting strongly with Slowing Areas, that still isnt "good" for shamrock itself and the density and positioning of said IZG's, specially because even when the Xel'naga is indeed pretty stronk, it isnt that important either, not to mention that players usually send a single unit to it. All of that out of the way, Shamrock got indeed quite close to the Finalists with a Top 6 spot, so dont be disheartened as it is a good map, and Id recommend resubmitting just like with Dispatch. 1) Do the judges feel that the backdoor would be too powerful for an attacker? 2) Do the judges feel that the lowground full-base third is too open? 1) Yes, even when you did good with how you managed the distances specifically for siegetanks only being able to barely reach the natural vespene geyser, it is still super spooky, because armies that set up in that position can still do lots of damage. 1) Do judges feel that a layout as crazy as this will always be automatically disqualified in the TLMC (short of a crazy natural/third set up challenge)? 2) This map isn't the most aesthetically pleasing. Did that come up with judges, and if so, how heavily is that weighed? Looking forward to your feedback and insight into the judging process! 1) Not... Really.... Remember that Sidian's Battle on the Boardwalk was a quite non-standard layout when it came to the gold base, but this one is certainly far more non-standard than that one. - what were the biggest problems with the map? Biggest issue are the 9 oclock gold bases, they are basically winner's gold bases. 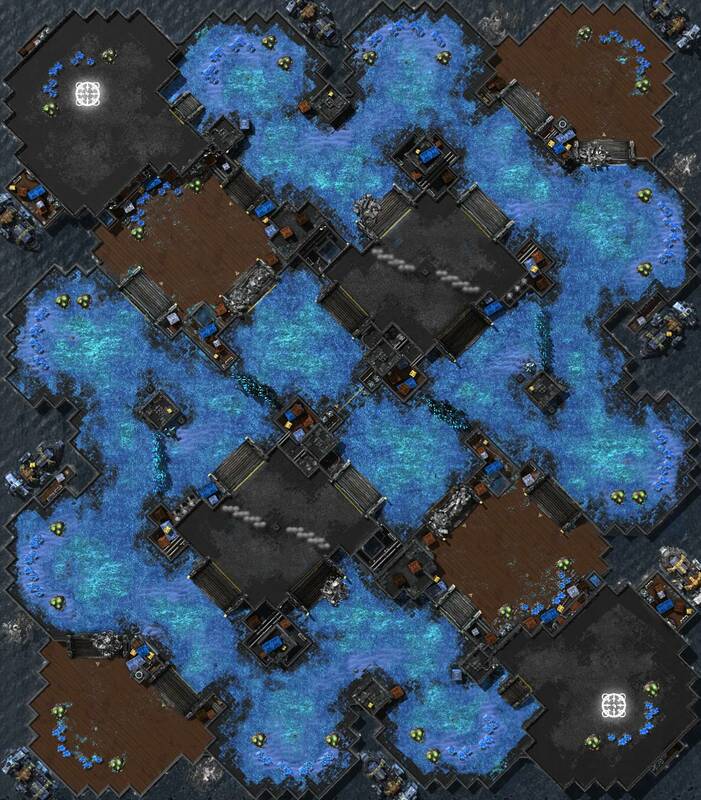 The problem with them is that, the gold bases in Habitation Station worked is exactly because they werent all too easy to take down because of the highground and the distance between the cliffline facing the xel'naga and the townhalls, and that coupled with the ramps facing each player allowed a "possible" defense of the bases. That simply isnt the case here. If the bases were just blue, and the collapsible rocks where changed by a mineral wall, then we could be talking, but that just isnt the case. - would turning the gold into a regular base make it less of 'a winner base'? Yeah, but other changes would be ideal as well, because it is not ideal having bases from different players that close to each other, and it would also be beneficial to give a some kind of a small bonus to players that overextend in order to take those bases. - comment about the aesthetic? Kantu kindly informed me of how the map didn't make it. 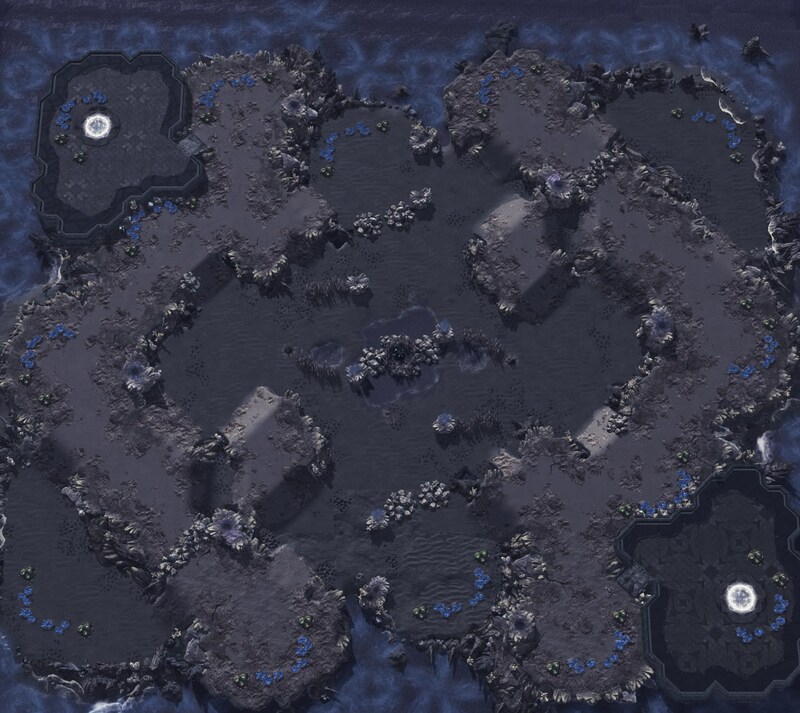 It was too vanilla with uninteresting middle and it was more like a macro map. To resubmit it in a standard category, can removing rock towers at the thirds' entrances work? Also I'm having a hard time fixing its middle since its external high grounds are already compactly placed. I can't really put more elevations there... Can bridges or simple chokepoints work there? Or a single obstacle on the middle to make it doughnut shape? I think the middle is alright or just hard to fix without handling outer basins. Those changes still have their own downstream problems, and there are issues with usage of space, specifically around the 2 and 7 oclock corners of the map which can be improved, but I feel that this version still retains the idea of it being a very "linear" map when it comes to the main attack path, but not overly so to the point that all attacks have to path through the middle of it. Hard to make any specific question for this map. This map is very standard macro map. I fixed the map after pre-judging feedbacks to make it more interesting. It is highly defensive but that cannot be a problem? Maybe its relatively small mains were the problem? Or were there too many chokepoints? I'd really like to know any comments from judging processes. The map isnt bad, it is just like uldolmok's first version, it is overly linear. Cloud Kingdom itself, because of how relatively choky the center is, it makes players want to take the side routes of the map. Superouman itself also made the map in a way that those players that actually take a longer route end up gaining a positional advantage, so players are encouraged to not only explore the map, but to play strategically.